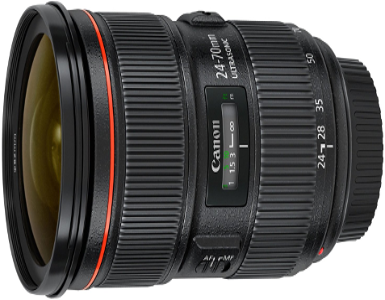 The 24-70mm f/2.8 II is intended to be a workhorse lens for professional photographers that has to deliver the best possible results in a wide range of conditions. It uses a suitably exotic optical design for this purpose, with 18 elements in 13 groups, including two 2 ultra-low dispersion (UD) glass elements and one Super UD aspheric element to minimize aberrations. Naturally it uses Canon's ring-type ultrasonic motor for fast, silent focus with full-time manual override, along with a circular aperture diaphragm for attractive background blur.